(L-R Lynn Rempel, Scott Corbett, Brendan Heppner) Congratulations to Scott Corbett for winning the Dale Rempel Man of the Year Award. 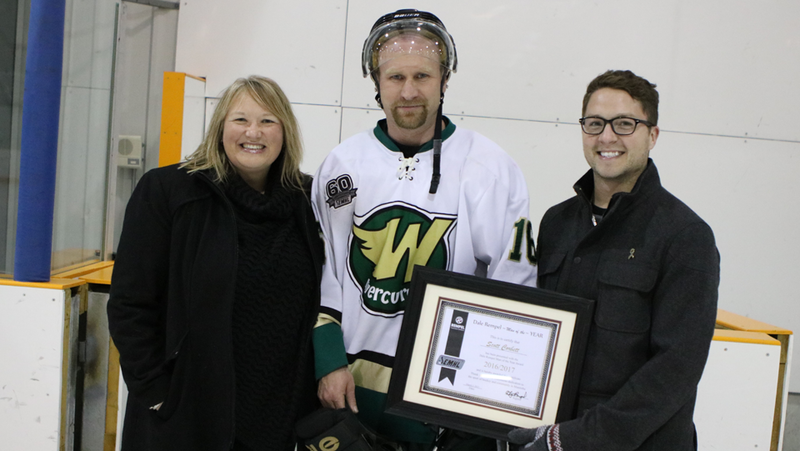 This award recognizes individuals who have made a significant positive impact in the South Eastern Manitoba Hockey League (SEMHL) and their community. It honours an individual who leads by positive example through on-ice performance, motivation of team members and a dedication to community activities and/or charitable causes. Scott is the captain of the Warren Mercs and demonstrates true leadership on and off the ice; when he speaks, the players stop and listen. In addition to his role as a player, Scott acts as the team’s general manager; scheduling practices, ice times and refs. He even drives the bus! He is a director for Interlake Minor Hockey and coaches his son’s Atom team. Scott also contributes to his community as a two term R.M. of Rosser councilor. He volunteers at school and church. Scott gives back to his beloved game of hockey and is a proud contributing member of his community.